Take your next costume back to the Jazz age with the White Jumbo Turkey Feather Boa. Glamour, nightclubs, and drinking till you dance and dancing till you drop defined the roaring 20's. Flapper dresses, suits, classy gangsters and living life to the fullest made the 1920's a unique and fashionable era. 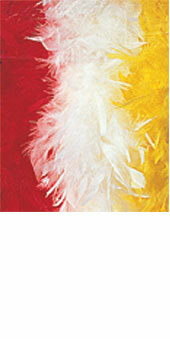 Spruce up your flapper or nineteen twenties inspired costumes with a bit of colour using this White Feather Boa!